The street races will be unlocked after completing various missions throughout the game. The first batch will be available after finishing Cesar's missions in Los Santos and can be found in Little Mexico marked by the chequered flag on the map. All of the street races are marked by a chequered flag, so they're not hidden or hard to find. Just walk up to one and stand in the red circle then choose which race you want to do. This guide will explain what each race is like, where you have to go, show a map of each route and explain rewards and other details about the races. For all races you'll need to speed around the course grabbing the checkpoints. Each checkpoint will have an arrow showing you the direction of the next one, and they'll also be marked on your radar. You will win $10,000 for each race you successfully win. 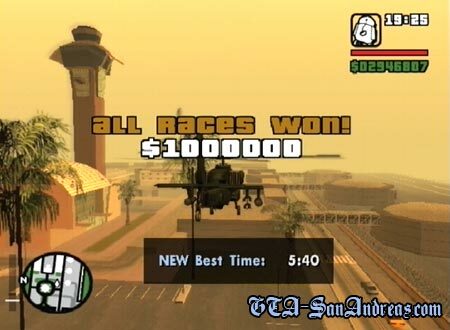 Once you've finished all of the races you'll be rewarded with a huge $1,000,000! Click on a map thumbnail to view the full size version. This race will most likely have been completed previously, however details you'll need to know are that the race ends at the pier and takes a few turns through the streets of Vinewood and Market. There is nothing in this race which should cause any sort of problem apart from oncoming traffic, so just take it easy, brake at relatively hard corners and speed down the straights. While this track is rather small, the fact that you're on a bike makes it a lot more difficult. Of course you can go faster, but it's a lot easier to bail from the bike, and it has a tendency to pull a rather stupid wheelie when you try to accelerate. You can speed pretty fast, just watch out for other bikers, cars and lamp posts. It's pretty difficult to actually win the race, so you may need to try it a few times before you get it right. Luckily it's short, so it doesn't take too long to do again. The only problem with the length is that it doesn't give you enough time to catch up if you make a mess of it half way through. You'll need a perfect run to win. This race takes you through some extremely dangerous roads at the start which are packed with cars. You'll notice a lot of the other bikers go flying, so keep up the pace, but be extremely careful to not bail or crash. If you can get through this in about third place you should be able to win the race on the way back because the road is relatively empty. As you get to the hairpin bend at the right of the map below make sure you brake, or you'll go off the side of the hill and be screwed for the rest of the race. Avoid the traffic and you should be able to catch up and win the race on the way back to the start/finish line. This race is very straight forward. The course is not difficult in the slightest, although the arrows can be confusing, however just stick to the road you're on or heading for and you should be fine. As long as you don't crash into a car you should easily be able to win this race. This is one of the most difficult street races of them all. For a start you're not exactly in the best vehicle for racing, but secondly the course is rather extreme too. The start is alright, but just after you pass the Vinewood sign the hills and corners can be pretty hazardous unless you brake and drive carefully. You'll probably watch 3 of the 5 opponents speed down a hill and roll their car, so if you maintain your speed and drive carefully, you should be able to gain a decent position before the race comes to a close. After the start, the rest is fairly straight forward. Watch out for the hairpin at the West of the track though! If you take the hills just past the Vinewood bridge well and slowly, you should be able to get into first place, and from there just drive VERY carefully, braking for everything and you will win sooner or later. This is another relatively hard race, but mainly because of the vehicles used by both yourself and your opponents. They're all fast cars, typically what you'd expect to see in a street race, however they aren't the best at turning at high speeds and will spin out easily. The race is long with a lot of straights, so even if you make a mistake, you'll have chances to catch back up. Be careful on the highway though, you probably won't notice how sharp the turns can feel at a high speed. Avoid all traffic too and if you can get off the freeway in first place, you should be able to win. Despite the fact this track is insanely long, it's actually incredibly easy too. For a start, you only have 3 other opponents which you can lose by the time you get out of the tunnel next to the airport. From there just carefully speed your way through the industrial traffic and get onto the freeway leading North. It's pretty much straight road all of the way, and cars will stop spawning when you get so fast, so unless you completely smash up your car, you should be able to hold together long enough and win by a mile. Even spinning out will give you more than enough time to get going again before you're caught but spinning out is hard to do thanks to the Bullet's great high-speed handling. Looking at the map you'd think this was hard, but it's not really too bad if you ensure you stick to the dirt roads and brake when going over the top of hills or around sharp bends. Once again you only have 3 other opponents, and they're a bit slower than you, so providing you don't end up in the drink and drive carefully enough, you'll win this race comfortably. This is exactly the same track as Badlands A, however you're doing it from end to start so to speak. Backwards. I suppose it's sort of like a new track, however just follow the same instructions as listed above for Badlands A, and you should be able to win this one fairly easily too. Once you've won this one, providing you went in order, that's all of the Los Santos Street Races complete. Bikes are always better at handling than cars, so this challenge is more about your driving skill than anything else. Just keep up your speed and use handbrake turns and if you don't make a really bad mistake like falling off a cliff, you should be able to win this pretty easily. This is once again a rather easy challenge because of the Bandito's nice handling on poor surfaces. Keep up your speed and brake at the right times and you shouldn't have any problems coming ahead of the other drivers. This race is slightly more difficult than the previous few due to the insane handling of the kart, and it's in-ability to go over curbs very well. Anyway, if you hav a good start and get along the alley in first or second, you shouldn't have too much trouble maintaining the lead. Remember to brake, or just let go of accelerate to slow down when turning, and avoid traffic, and you should win easily after you get to know the track. This race is another pretty simple one. You're in one of the better "average" cars, but so are your opponents, so it's not too difficult to catch up. The track itself isn't hard, but you need to know where the right places to turn are, which can only really come with experience, so you might fail the race a few times before you get it right. This race again isn't too hard, however the vehicle you're in will blow up very easily. Make sure you don't have any wanted stars before attempting it, because you'll need to go at least half way without taking any damage to be sure of finishing in one piece. The opponents aren't hard, the track isn't hard if you brake correctly, but the engine isn't hard either and it'll be smoking with one or two medium collisions. It's more of a race between yourself and other traffic than the other racers. Make sure you don't smash up the car and you should be able to navigate your way to victory. Just looking at the map for this one will show you how insane this is going to be and how long it's going to take. Of course the great thing about a long track means more time to gain time on the other racers, and more space to use if you need to catch back up. If you can drive, and I assume you can for getting this far, this should be no problem at all. You'll hardly notice how fast the time passes by as you fly across the country and you'll be half way before you know it. From there, providing you're in first, you can pretty much go as slow as you like and you'll still win. If course you can speed faster than anything else possible going down some of the hills there, but you need to be careful not to smash up your car because remember, it's an endurance, not a full blown out sprint. You should actually be able to make it around the track in just over 5 minutes. This is a fun race which is a sprint to the finish from San Fierro to Las Venturas. It's completely straight forward and your only worries will be avoiding traffic and dodging the water. You can go exceptionally fast in the Banshee, but you may wish to slow down any time you get near to water or you'll be sinking your way out of the race. Keep up some speed to the LV Airport and you'll be the winner. Once again this is pretty straight forward, although the sharp turns and water hazards can be a real pain. Watch out for those rocks if you're trying to take a shortcut too, or it'll likely take longer than going the proper way. You can take quite a few good shortcuts at the end of the race if you need then, but by then you should be far enough in front to win. This race isn't exactly harder than the previous one, however it's closer in terms of opponents. You really need to have a pretty much perfect run in order to be way out in front when it finishes. There aren't any hard sections, but some can be pretty fast and may need you to slow down. Look at any of the corners with less than 90� bends and you should be thinking about braking. While this may look like the easiest track ever, and it is, there is an incredible amount of traffic swerving back and forth to different lanes, and it's almost impossible to speed around the track at full speed without hitting at least one of them. You can still pull the car back under control and stay in first place, but after so many crashes your car will be up in flames. Stick to the outside, but watch out for the turn offs. This is not a race, it's a checkpoint collection challenge. You can take as long as you want to complete it. Because of this reason, I have not included as much information on these as opposed to the actual street races. Be aware that the planes are flying bombs and if you crash, you die. I suggest you just take it easy and let the plane glide through the corona's, rather than flying at full speed. You'll be flying the Rustler over Los Santos. The plane had fairly good handling, however if you miss a checkpoint, you'll need to fly pretty far before turning around to get it again. The Stuntplane is probably the worst plane to fly in the game. It's handing is way over-responsive and you'll find yourself spinning around rather than turning slightly to change direction. I suggest using the rudders with L2 or R2 and also let the plane glide rather than flying at top speed. Tapping accelerate works well too. You can take as long as you want, but this track is pretty long, so you'll need to be careful for a good few minutes before you're done with it. Trust me, if you can fly this plane, you can fly anything! The longest race in the game. Done in one of the quickest times. Don't forget that the Hydra is a Harrier Jump Jet and can fly in hover mode AND flight mode. Hold forward on the R3 stick for about 2 seconds to switch to full flight, and you'll notice the incredible speed boost. It also has great handling, but you might miss a few checkpoints because of the speed, so be prepared to go back. I'd say it's best to go into full flight mode, but glide and hold square to move at a reasonable speed so that you don't miss any checkpoints. This is not a race, it's a checkpoint collection challenge. You can take as long as you want to complete it. Because of this reason, I have not included as much information on these as opposed to the actual street races. Be aware that the helicopters will explode if they take too much collision damage and you'll die. I'm assuming you know how to fly a helicopter seeing as you're this far in the game, so I'll just say that this will not be a problem at all. Fly through the easy checkpoints in one of the easiest controllable vehicles in the air and make your way around the course. The final street race challenge, if you're doing them in the same order as me. This one isn't hard either and you're in a hunter which has great handling. Don't fly into the buildings too many times and you'll finish it pretty quick.